It is worth mentioning here that, just as, all that glitters is not gold, all ideas cannot be sold. It is the role of a product manager to assess which idea is worth selling and which goes to the trash bin. 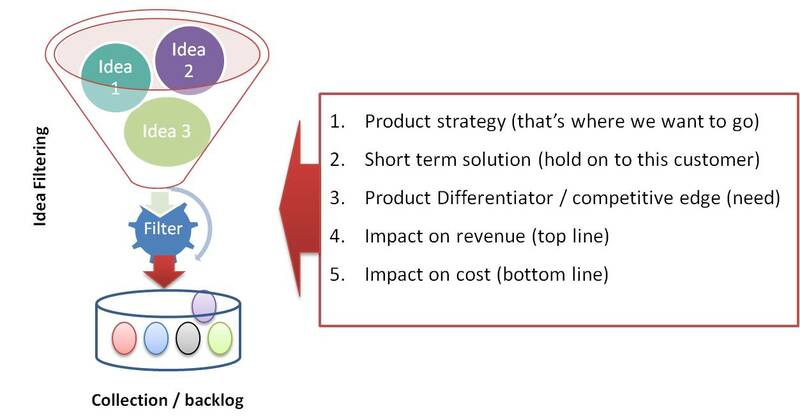 Product managers should maintain the quality of product backlog by exercising all due diligence to avoid non-relevant requirements from entering into the backlog. This is where you should put on the hat of a business man, entrepreneur or the CEO and play devil’s advocate. How is adding this feature going to help me? What if I do not add this feature to the backlog? why this feature first? – Align reasons to one of the four categories mentioned in the image, and if you find a match, then go ahead and add this to backlog. Else leave it at the desk from where you heard it. Remember, it’s your duty to maintain the quality of the product backlog, and you best acknowledge the fact that a idea is good only if it can make money for You.